Spilsby Surgery serves the market town of Spilsby and its surrounding villages in the Lincolnshire Fens and Wolds. The NHS is changing fast and probably not for the better. 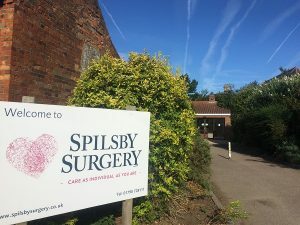 Spilsby Surgery believes it is vital to balance innovation with the values of traditional General Practice – putting individual patients and their families first, and responding to local needs as we evolve your future care. We are loyal to our dedicated team, and supportive of healthcare colleagues who place quality care ahead of expediency. We are honest in our conversations with patients about what we can realistically deliver with the dwindling resources at our disposal, and invite you to work in collaboration with us to sustain safe and sustainable services for all our patients. Our website introduces you to your healthcare team and the services we provide in order that you can access the care you need. It provides a convenient way to contact us. The website provides surgery news, our views on your healthcare, and links to other sources of care and information we trust. It also hosts information from your Patient Participation Group. Spilsby Surgery is the grit in the oyster of Lincolnshire East Clinical Commissioning Group. We are a member of the new Primary Care Lincolnshire Medical Services GP Federation (PCLMS) supporting a majority of GP practices in the area. We are a founder member of the Lincolnshire Community Educational Provider Network, delivering specialist training to doctors wishing to become GPs, to medical students and to nursing students. Our Patient Participation Group carries clout. We would welcome your continued feedback about this website in order to improve it for you and your community. Online Booking and Prescription Service! Please note that the appointments available for booking through this system are limited and should not be used to assess appointment waiting times. Access to your Summary Patient record is also available.